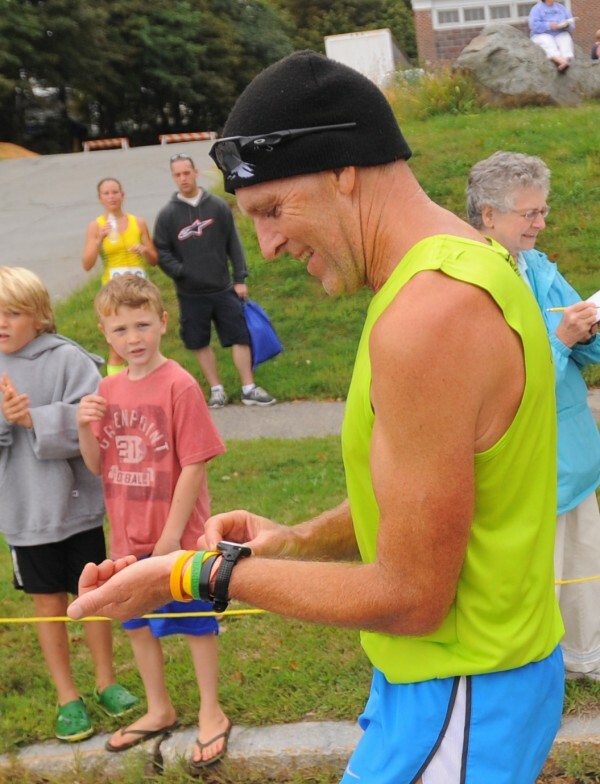 Gary Allen checks his time after finishing the 50th Bangor Labor Day Road Race on Sept. 3, 2012. Allen will begin a 500-mile fundraising run on Jan. 24 to East Rutherford, N.J., site of Super Bowl XLVII. 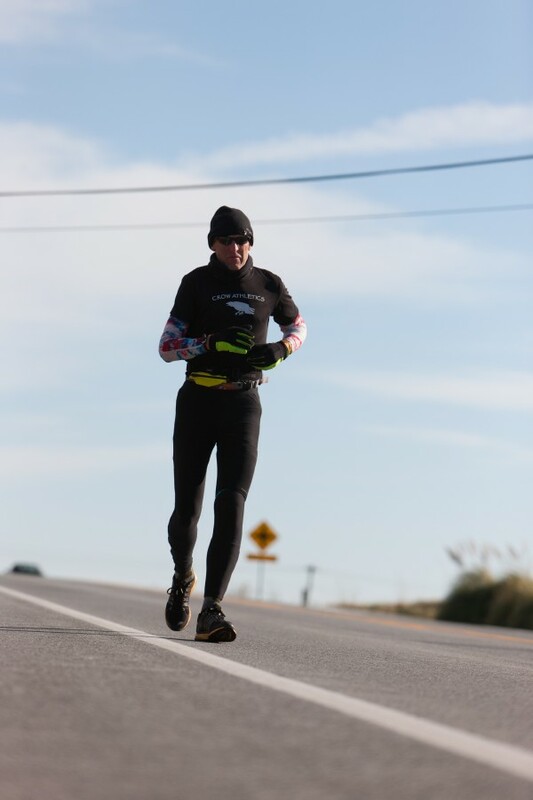 Gary Allen runs in Maryland last January during his fundraising run from Maine to Washington D.C.
Gary Allen routinely runs distances many people would rather not even drive. So when he recently shared word of his latest planned long-distance fundraising sojourn — a 500-mile, 10-day trek from the summit of Cadillac Mountain on Mount Desert Island to MetLife Stadium in East Rutherford, N.J., site of Super Bowl XLVIII — few who know him were taken by surprise. By Allen’s standards it’s a virtual sprint. Last winter the 12th-generation native of Great Cranberry Island ran 705.2 miles from the top of Cadillac to the U.S. Capitol in Washington, raising more than $16,000 for the Wounded Warrior Project, American Cancer Society and survivors of the Sandy Hook Elementary School shootings in Newtown, Conn. This year’s run, averaging 50 miles a day from Jan. 24 through Super Sunday, Feb. 2, again will benefit the Wounded Warrior Project, which provides programs and services to severely injured service members during their transition back to civilian life. “It’s not about me and it’s not about a football game,” said Allen, whose website where donations may be made is www.maine2superbowlrun.com. “I run anyway, so if I’m able to run and it helps raise awareness for some people in uniform whom we should be eternally grateful to and maybe raises a few dollars for them in the process, it’s the least I can do. “I’ve just seen so many stories of wounded veterans who have come back home and they really move me,” Allen said. Taking on unique running endeavors is nothing new for the 56-year-old entrepreneur and founder of the Mount Desert Island Marathon and Half-Marathon. Allen has completed 91 marathons and six ultramarathons — and those are only the countable ones. He has run the Boston Marathon 21 times, and he has also run that course unofficially each New Year’s Day since 2004 — just to get the new year off to a refreshing start. When the Bangor Labor Day Road Race celebrated its 50th anniversary in 2012, he arrived at the course shortly after midnight on race day and ran the 5-mile loop nine times before running the race for a total of 50 miles — one mile for each year of the event’s history. And when the 2012 New York City Marathon was canceled due to Superstorm Sandy, Allen made his way to the site and ran the course anyway. “It’s a little crazy with some of the things he does, but crazy in the most beautiful way,” said Mary Ropp of Hulls Cove, who serves as co-director of the MDI Marathon, an event Allen first staged in 2002. But there’s also a competitive side to Allen’s running resume. Of his 91 completed marathons, Allen has finished 67 in less than 3 hours. He’s run at least one sub-3-hour marathon in each of the last five decades, with his first coming in 1978 and his most recent a 2:58:36 finish on Nov. 17 at the Philadelphia Marathon. That race came just two weeks after he just missed the 3-hour mark (3:00:37) while completing the New York City Marathon for the 15th time. “It was big for me,” said Allen, whose 35-year span between his first and most recent sub-3-hour effort now ranks ninth-longest among marathoners worldwide. “New York City was a little disappointing when I missed going under three hours by a half-minute. I could literally see the clock at the finish line going from two to three hours, and that was hard. The continued prolific nature of Allen’s running career may be in some respects a case of mind over matter forged while training as a youngster running back-and-forth along the two-mile main road that stretches across Great Cranberry Island, a small land mass located just off MDI that is home to 40 year-round residents. Allen estimates he has run more than 100,000 miles since watching American Frank Shorter win the 1972 Olympic marathon, reflecting an uncanny ability to ignore any monotony related to the repetitive nature of placing one foot in front of the other literally millions of times. Allen’s running career also has been remarkably void of major injuries. Perhaps the most significant physical setback he has endured was a partially torn hamstring suffered in Newark, N.J., during last January’s Maine to D.C. run. Allen doesn’t spend a lot of time planning out his training regimen, but it often works out to between 60 and 100 miles a week. That spontaneity extends to the logistics of his longest runs. Last winter Allen relied on a small group of friends for support at the outset of his run to Washington, D.C. As the run continued, support typically came from people he didn’t know who had learned of his charity effort through social media. That relationship had been stalled temporarily, Ropp said, when Allen’s Facebook account was hacked and not working for two weeks in advance of the 2012 run. Yet Allen stayed in a hotel just one overnight during the trek, with accommodations on other other evenings provided by supporters along the route. The upcoming run to the Super Bowl likely will have a similar benevolent foundation, which Allen believes is another lesson to be derived from these journeys. “Running at times is selfish by nature, at times it takes time away from family,” said Allen, who lives on Great Cranberry Island with his wife Lisa, daughter Matilda and son Patrick. “For me to do something like this that’s not selfish enables me to give something back, it feels like a great thing to do. “We’re all capable of doing more than we think we are,” Allen said. Allen doesn’t have a ticket to the Super Bowl — for him the primary hope is that the game will serve as yet another way to create more exposure for the fundraising effort behind the run. “My goal is to do this in 10 days, but if it takes me longer than 10 days then I’ll get the score of the game off the car radio,” said Allen, who will observe his 57th birthday during the run on Jan. 29. Allen also anticipates facing Mother Nature’s winter wrath at some point during the trek, but says his Down East disposition won’t allow snow and cold temperatures to deter his quest.